The SIX Show … just six?! I love the “neon” graphics for the opening of The SIX Show; they’re eye-catching and well done. And when the entertainers rock the stage with Don’t Stop Believin’, you’re loving the singers and the band and … wait, there’s no band. That’s right. No band. 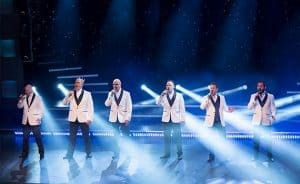 There are just six brothers whose voices not only sing but also reproduce the sounds of instruments. And they are amazing — Lynn, Barry, Kevin, Jak, Owen, and Curtis Knudsen. They sound like singers backed up by a band. But it’s just SIX. No matter how many times I look for the drummer! Their song list is effective; it keeps the show moving at a fast pace. Songs like You’re the One and I’m Still Standing (“Looking like a true survivor”) elicit smiles of recognition from the audience. Every song is one you’ve heard, and yet the familiar rhythms take on a new feel as you watch and listen to SIX produce an entire concert with just their voices. Donning cowboy hats, the brothers do a medley of Mamas, Don’t Let Your Babies Grow Up to Be Cowboys and Rhinestone Cowboy. “Wardrobe changes” like that and changing jackets (like the colorful, casual jackets for I Wear My Sunglasses at Night), the choreographed movements, all combine to keep the stage filled with entertainment. In 1987 the Knudsen Brothers went to California to be street performers. Yes! Doing 50’s doo-wop in LA. SIX gives us a fun sample of those days, coming down off stage to sing, complete with a hat for tips. (If you’re sitting in front, have some change in your pocket!) Back on stage, Owen does a wonderful rendition of Shenandoah, which has always been one of my favorite songs. Earlier Lynn did a great “Satchmo” for What a Wonderful World, and who doesn’t love that song? And Barry … well, Barry sings really high for the Beach Boys medley! Later, Jak’s The Sounds of Silence is extraordinary. They talk a little bit about their family. There were four more boys born after Curtis. (“They really wanted a girl!”) So I guess you can forgive them if they don’t always get his name right. “It’s Curtis!” They joke that the other four brothers are normal. “They have real jobs.” The boys do have a sense of humor. You have to smile when you look at Kevin. Who else could pull off a Statue of Liberty crown-style hairdo?! The boys’ parents took them to musicals whenever they could, and the boys still love that music. Climb Every Mountain and The Impossible Dream are two all-time favorites and really show off the boys’ talents. Jesus Is Tenderly Calling is reminiscent of hymns that were the songs the boys first learned. The audience loved I’m an American Soldier in their tribute to our Veterans. 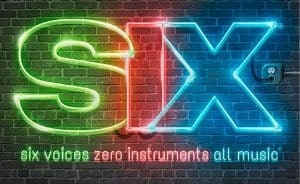 SIX is on stage at the Hughes Brothers Theatre on Branson’s famed “76 Strip.” You’ll be amazed as you enjoy the vocal band experience of SIX!